Are you a fan of peanut butter or do you prefer the other nut butters out there? I can go either way. While some good old peanut butter is delicious with jelly on a soft bread sandwich, the richness of cashew butter is incredible to dip an apple or celery in. Right away I wanted to make fudge for today and use up the remaining peanut butter chips that I received a while back. Unfortunately, I didn’t have enough of them left to make an entirely peanut butter fudge, but there is absolutely nothing wrong with the classic pairing combination of some good old peanut butter and chocolate. 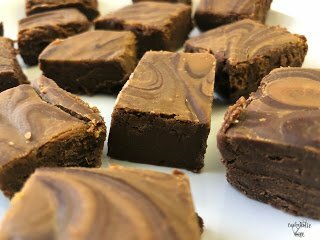 Traditional fudge, made with a candy thermometer, is really not my thing. 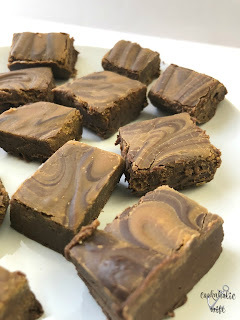 I have a candy thermometer and likely enough patience to make it that way, but when you can make fudge by microwaving together some ingredients and then refrigerating them…why not go that route? 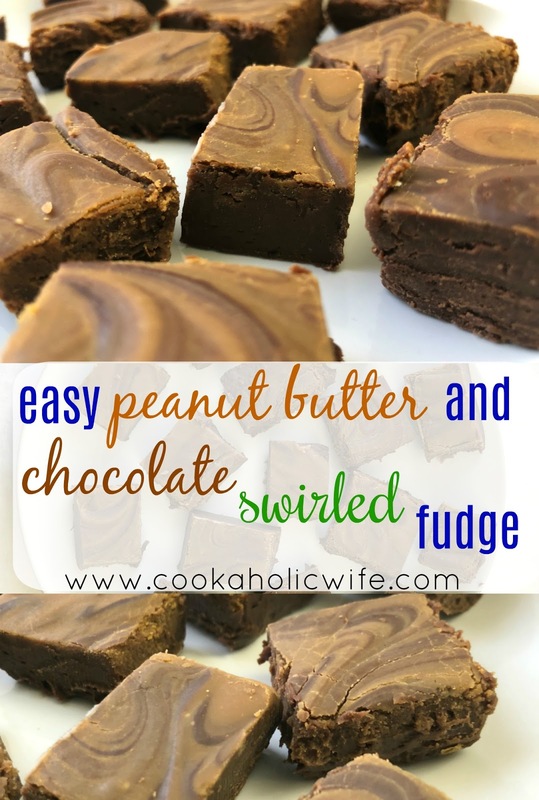 No more messing with candy thermometers and exact temperatures, this Easy Peanut Butter and Chocolate Swirled Fudge is made by microwaving ingredients. In a microwave safe bowl combine the chocolate chips with 1 cup of sweetened condensed milk (spray your measuring cup with non-stick to allow it to slide back out easily), 2 tablespoons of butter, ⅛ (a pinch) teaspoon of salt and the vanilla extract. Microwave in 30 second intervals, stirring well after each for 1 minute to 1 ½ minutes, or until the mixture is completely smooth. In a smaller bowl, combine the peanut butter chips with the remaining sweetened condensed milk, butter and salt. Microwave in 30 second intervals, stirring after each until the mixture is smooth. Pour the melted peanut butter over the chocolate mixture and use a knife to swirl the peanut butter into the chocolate. Refrigerate for at least 3 hours but up to overnight. Using the overhang parchment paper, lift the fudge out of the dish. Slice into 16-20 squares. Rich, peanut buttery and chocolatey! 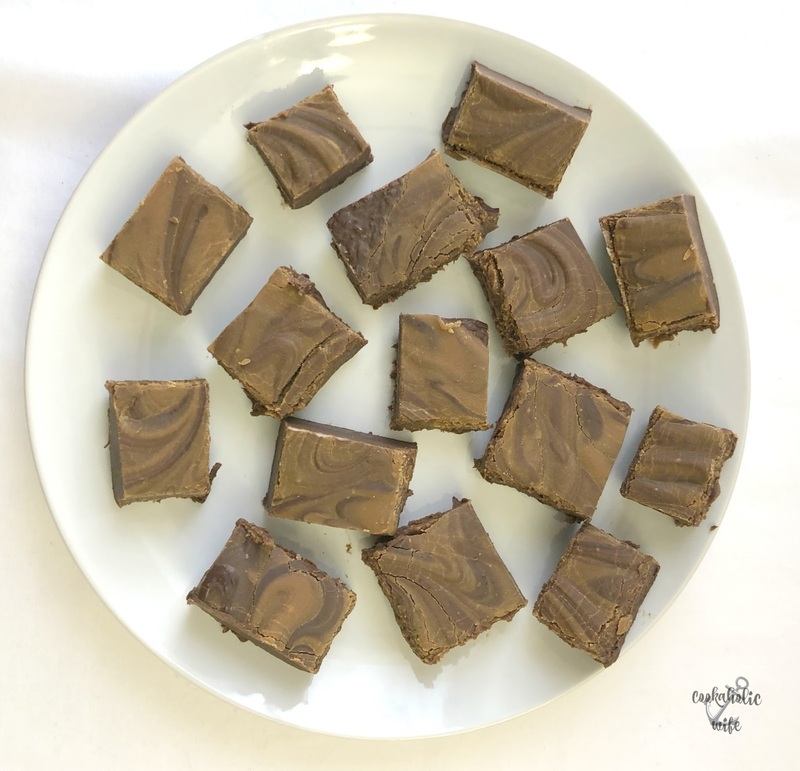 What more could you want from an easy fudge recipe? This fudge could easily be dangerous!!! I could use a new fudge recipe. This is a keeper! 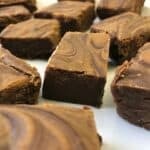 Fudge is so delicious! I definitely need to make this soon! Oh my goodness! Delicious and easy peasy!!! I need to make these this weekend! Yum!! I can't wait to make this! Your fudge is simply gorgeous! I've never made my own before, but my husband's Papa would make massive amounts at Christmastime. Always brings back memories for him. Such a delicious fudge filled w/peanut butter and chocolate, what could be better! /delish! One of my favorite flavor combinations, and you made it so easy to make! Love this recipe!